This is pretty much what the whole episode feels like. It’s some day or another. Who even cares? Look, for a solid month now I’ve been reviewing episode after episode of mediocrity, slogging my way through such gems as The One Where a Character Helps Another and the Second Character Gets Clingy, The One Where a Fan Favorite One-Shot Comes Back and Is Less Interesting, and The One Where a Character Blows Off Their New Job and Creates a Disaster. And for all of them, I’ve tried my best to find some interesting take, some novel idea or recurring theme to pull out and spin into a post for you. But now we have The One Where Everyone Is Facepalm-Inducingly Incompetent, and I’m done. There’s nothing interesting to be said about this episode. The most interesting thing about it is its complete lack of anything interesting–but if that’s interesting, then the episode doesn’t completely lack anything interesting, and therefore loses the only thing that makes it interesting. It is a perfect eternal circle of mediocrity and failure. It’s not actually the worst episode of the show. It’s not even the worst episode of the season. After all, this season contains an episode that can actively hurt the children watching, possibly two. But that at least is interesting and gives me something to write about! So no, this is not the worst episode. It’s not even the worst episode for me to try to write about–it’s not going to leave me feeling physically ill and emotionally exhausted the way, say, writing about “One Bad Apple” did. So it’s not even superlatively bad. It’s just bad. Given Rarity’s side plot about struggling with Princess Cadance’s hair, what seems to be happening is that the episode is trying for farce. In farce, an assortment of characters with their own incompatible agendas and perspectives (which is what the episode title is referring to–Games People Play is a moderately famous book about the psychology of “mind games” and hidden agendas in relationships) act foolishly, repeatedly misunderstanding each other and making mistakes. Most characters are depicted as being completely incompetent, and any characters who are competent generally fail anyway due to bad luck or reliance on incompetent characters. Which, so far, is a fairly good description of the episode: Ms. Harshwinny is competent, but stymied by the incompetence of the welcoming committee and repeatedly splashed by passing ponies. Rarity keeps trying to take shortcuts, ruining Cadance’s hair. The welcoming committee welcome the wrong pony, while repeatedly failing to check whether they have the right pony, and that wrong pony inexplicably fails to inform anyone that she is suffering from claustrophobia, and instead just keeps making excuses to try to go outside and meekly going along when the other ignore her excuses. The problem is that most of these threads are extremely repetitive. Farce works by means of a form of suspense; as each character’s antics become more ridiculous, it becomes more obvious to the audience that the situation can only end in disaster when the disparate threads finally collide. This anticipation builds, until finally it is released in the climax, which pays off the anticipation in an eruption of chaos. To see this structure executed well, watch a performance of Shakespeare’s Comedy of Errors or Wilde’s The Importance of Being Earnest, or just pick any episode of Arrested Development at random. This, unfortunately, is not what happens in the episode. The closest is the thread of the not-Games Inspector’s claustrophobia, where her reactions do become steadily more absurd, culminating in a ridiculous chase through the streets with a pot on her head, which results in Rainbow Dash being flung across the city (and, when Rarity hears her crash into the dome but doesn’t see her, the funniest moment in the episode). The thread in which the welcoming committee doesn’t know that she’s not the Games Inspector, however, is more frustrating than funny, and Rarity’s first and second failed attempts at Cadance’s hair look basically the same as far as the audience can see. Worst, however, is the Harshwhinny thread: she is dragging her luggage past a puddle when someone runs through it, splashing her. Later, this happens again. That’s her entire thread. Eventually, everyone ends up at the spa for no particular reason, which is where the rising anticipation of disaster (which has not actually been rising, due to the lack of escalation in most of the plots) should pay off as the threads collide and interact chaotically. Instead, the claustrophobia thread has already peaked and the welcoming committee have realized they have the wrong pony without ever really getting any humor out of it. Rarity has perfected Cadance’s hair off-screen and without apparent fuss. And then Harshwhinny and the unnamed, claustrophobic tourist resolve the main issue between themselves, such that everything works out for everyone. 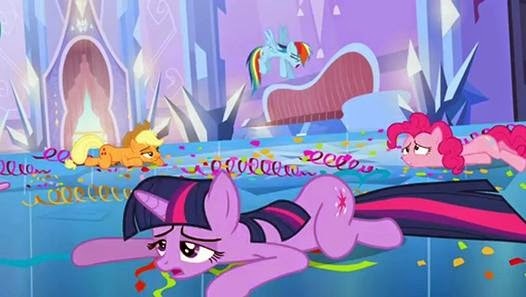 The episode, in other words, just skips having a climax and goes straight to the denouement, fizzling out with a whimper to make room for Applejack and Twilight Sparkle to deliver the punchline to the previous episode. So it fails at farce. Do we at least get something resembling a character arc for, well, anyone? To which the answer is, “Well, sort of.” Rainbow Dash seems like the best candidate–she’s heavily invested in getting the games to come to the Crystal Empire as a way of compensating for a childhood disappointment, and she gives a little speech at the end about how she made things worse. But an arc is more than just a sequence of events; it requires causal connection, and there just isn’t one here. Rainbow Dash doesn’t drive the Game Inspector away by being overenthusiastic, doesn’t get carried away by her vision and miss something important, or otherwise cause the apparent loss of the games; she and the others simply don’t think to ask the name of the pony they meet. No, the closest thing we get to an arc is Rarity’s almost entirely offscreen plot, in which she starts out taking shortcuts in her efforts to properly prepare Cadance’s headdress, and then either realizes she needs to stop taking shortcuts, or discovers the right shortcuts, and gets the headdress right. She messes up, she learns, she gets it right; that’s an arc; it’s just a very basic one that we don’t actually get to see most of–but in this episode, that’s the best we get. There is no word for this except “mess.” And coming after three straight episodes of mediocrity, in a season that had already before that seen as much bad as good, a nasty doubt surfaces: Is this show even worth watching anymore? It is clearly floundering, casting about desperately for quick fixes and easy answers. Whether this is a result of Equestria Girls pulling resources or the loss of direction engendered by the departure of Lauren Faust (who left before Season Two began airing, but was nonetheless involved at the writing stage of most of that season’s episodes), it remains a clear and serious problem for the show. If something doesn’t change, it’s difficult to justify the show continuing. It needs a new direction, an injection of energy, some bold, maybe even controversial, departure from the formula in order to pull itself out of this rut. But that seems unlikely, given how very safe it’s been playing these last few episodes, sticking to recognizable sitcom formulas. Even with the season finale next episode, it would be too much to hope for some kind of dramatic alteration to the show’s basic premises. Next week: But we do get a surprisingly lifelike facsimile thereof. Not… really..? Did I give that impression? I agree with your assessment, but I don't think I realized at the time that this episode was Not Very Good. I was too distracted by the presence of a character with a disability whose disability was not the central plot point of the episode. Sure, it's convenient to the plot (and to the farcical conceit) that the unnamed tourist has claustrophobia, but the plot isn't about her or the other characters coming to terms with some aspect of her claustrophobia. It's so rare to see a character with a disability on TV depicted as simply a character who happens to have a disability, that I can basically forgive the flaws this episode has.